Plastic Soldier Review - "Age of Mythology"
Home > Features > "Age of Mythology"
Age of Mythology is a board game by Eagle Games that was originally a computer game by Microsoft and Ensemble Studios. Essentially it is a game whereby each player must build their economy and army and defeat their opponents, so both military strategy and economic management are required. 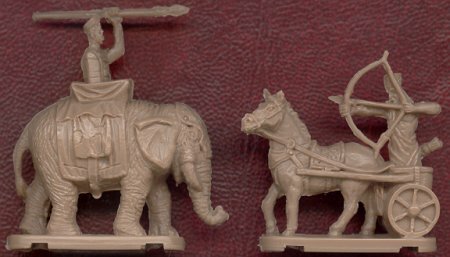 The players have empires based on three themes - Ancient Egypt, Classical Greece and Vikings - and the game includes a large number of plastic miniatures representing the various elements of these empires. While some of these are pure fantasy, others may be of value to the historical enthusiast, perhaps as material for a conversion, so we have taken a closer look at what is on offer. The figures for each of the themes are divided into three categories - mortals, mythical creatures and heroes. In general we are only interested in the mortals, and on occasion some of the heroes. Those of the Egypt theme which may be of value are shown here (click here to view all the Egyptian pieces). The first figure is supposed to be a pharaoh, with a priest next to him. The third figure is a spearman and the fourth is a villager. They are a rather tall 1/72 scale (as a guide, the villager is 24mm from sole of foot to top of head), and the thick base only exaggerates this height. However by filing down the base, they become more acceptable, and in fact they are about the same size as the Atlantic Egyptian Infantry, which is very good. Of course the Egyptian civilisation lasted for many centuries, and costume changed much over that time. The villager is simple enough to be of use for any part of the period, but we could not tie down the rest to a particular time. The soldier is quite elaborately clothed, which suggests the later part of the Egyptian era, but he is more generic Egyptian than of a particular moment, which is all that the game requires. However he does hold a very thin shield, which would seem to be of little value in protecting him in battle, and is not authentic for any historical period. He is also holding a spear upside down, point resting on his leg, which is ridiculous. All the figures are nicely sculpted and with good detail and very little flash. They all have grooves on the underside of their bases, and the first two have triangular bases, which looks a bit strange. However the Pharaoh and villager in particular could be put to use in a historical setting. The game also includes some Egyptian cavalry elements. The first is a man riding an elephant - not something that the ancient Egyptians ever actually did. Pretty much everything that can be wrong with this figure is wrong, and it is difficult to know where to start. The creature itself is tiny, being about 22mm at the shoulder, so any human looks down on him. The man riding him has no legs, and seems to appear from the top much like a tank crewman does from his vehicle today. Much the same could be said of the chariot, which is very small, is pulled by a single horse (whose tail is inside the chariot itself) and is solid plastic, causing the upper part of the one archer to appear from within it. Both these pieces are representative, and are easy to use in that they come as one solid piece rather than an assembly, but they are of no real use for anyone interested in historical accuracy. The Greek theme has more figures that could be of use since all their heroes are human (or at least gods in human form). The two pictures show all their mortal and hero figures, and all are in appropriate clothing and armour for the Classical period. Once again the intention is only to be Greek-like in appearance, but for the most part the look is pretty authentic. As with the Egyptians the villager can serve as a civilian from a very broad period of time. The first figure in the second picture is of a man wearing a lions head and armed with a club. Clearly this is Hercules, who killed the Nemean lion as the first of his famous labours, and is usually said to have worn a lion skin such as this. All very interesting, but there must be limited call for men so dressed and armed in representations of real Greek armies. The cavalryman is a fair job, but like all the figures he comes as one piece, i.e. with man and horse together, so detail is obviously scarce. This man is considerably smaller than the foot figures, which average 24mm in height, so he looks a bit daft when stood next to them. The same comments regarding quality of the figures apply to these as to the Egyptians. While none of them are in action poses, some could be utilised for historical purposes if used in conjunction with the various better sets of Greek infantry already available. To see all the Greek pieces, including those mythical creatures, click here. The third and final theme is Norse, and once again the figures could best be described as adequate rather than good. 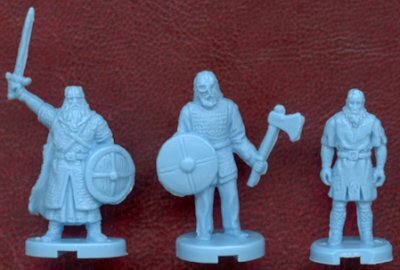 The first two figures on the left are heroes, and therefore they don't pretend to be the normal appearance of Vikings. Just as well really, since they are certainly not, with the helmets being particularly unreal. The 'horns' on the first helmet resemble ears or perhaps wings, while the second has a very modern pair of angular horns. Happily the myth of Vikings with horns on their helmets has been put to rest, and both these figures would be better for having their horns trimmed off. The mounted warrior is odd in several respects. He carries a weapon in each hand, plus a shield on his right arm, and presumably would expect to have to hold the reins from time to time. His overall appearance is not particularly Viking-like, and he is considerably smaller than the foot figures, so even mounted he is barely higher than those that are dismounted. Like the Greek cavalry, he is moulded as one with his horse, so much detail has been lost. The second group of figures is much more like it. Though still including some doubtful elements, they would at least pass as Vikings from a distance. Detail is fair but some areas such as where the man holds his shield the detail runs out entirely. For example, the middle warrior has no lower right arm as it simply merges with his shield. The villager, who is noticeably shorter than his compatriots, is perhaps the most accurate, though this is due in large measure to his simplicity. The full range of Norse pieces can be seen here, but they do not offer very much for the serious modeller. The game includes roughly equal numbers of pieces for all three themes, but Eagle also sell the figures by themselves. This makes them much cheaper than buying the full game, and means only those themes that are of interest need be purchased.